Ray and Pearl Shields were married in Long Beach, California in July of 1953. Ray is the son of the late Walter and Ethel Carder Shields of Parkersburg, WV. Ray worked for the Department of Defense as a Chief Test Engineer at Long Beach Naval Shipyard, Long Beach, California and the Norfolk Naval Shipyard, Portsmouth, Virginia. He retired in 1993 from Norfolk Naval Shipyard. Pearl is the daughter of the late Israel (Izzy) and Nola Barnhart Ault of Parkersburg, WV. She has taught piano lessons and women's Bible classes for many years. 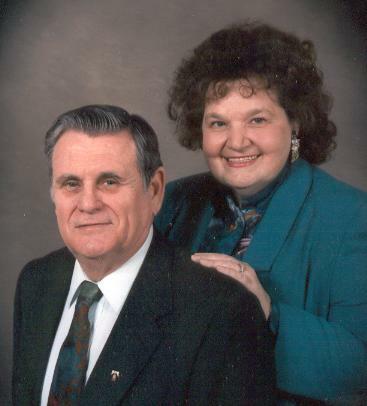 Ray & Pearl lived in Long Beach, California for 26 years and in Virginia Beach, Virginia for 21 years. They have moved back home to Parkersburg, West Virginia. Ray & Pearl have a daughter, Cyndie Tucker and her husband Jim, and a son, Walter, Jr. and his wife Wendy. And, they are proud of their five grandchildren. The children of Ray & Pearl invite you to share in their 50th anniversary. They will be hosting an Open House on Saturday, July 5, 2003, 2:00 p.m. - 4:00 p.m., at Ray & Pearl's home in Parkersburg, WV. For more information or directions, please email Cyndie Tucker at tuckfam3@juno.com. We hope you will join the Shields in celebrating 50 years of blessings!